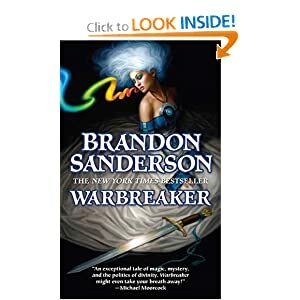 If you look at Sanderson's 600+ page novel and feel nervous about jumping in, I'm here to say that even for a science fiction hater like me (and one reading under an ever-shorter deadline) Warbreaker was packed with the things all good books should come with-- interesting, well-drawn characters, a compelling plot, and ideas left to chew on once the reading is done. The king of Idris must send one of his daughters to marry the presumably evil god-king of Hallandren in order to avert a war. However, instead of sending Vivenna, who has prepared her whole life for the role, the king sends her younger sister Siri. Vivenna follows, and gets mixed up with mercenaries, and finds herself discovering that the rich colors of Hallendren make things appear different from what they really are. Sanderson has a whole theory going on here about breath, how taking it decreases the life of the giver, and how it can be taken forcibly or freely given. The breath can then be used to animate inanimate (or dead) objects. I think a sci-fi lover would really get into all of that stuff. For me, it was the relationships between Siri and the god-king, between Vivenna and Warbreaker, and among the lesser gods of Hallandren, that made the story interesting.